As part of my Lenten sacrifice, I have decided to give up Facebook. No, probably won’t help world hunger, help homeless people or stop wars, but part of Lenten sacrifice is also about getting back to basics and self improvement, self discipline and self denial. I thought – OK, what have I started getting addicted to lately? What do I check first thing in the morning, last thing at night, check on my iPhone when waiting? Facebook. So, today marks 20 days without checking what everyone else is doing and telling the world what I’m doing through Facebook. And it’s hard!! Wifey still is on it and I’m so resisting peeking over her shoulder to see what so and so is up to. And everytime I do something remotely interesting, I find this inner urge to tell everyone on Facebook – that I now need to supress. I’m still keeping up this blog, but to a less regular degree as this is not so much a time waster and addiction for me like Facebook. Anyone else giving up Facebook for Lent? Yesterday, I read about Facebook Connect being expanded to the iPhone. Having not really played with Facebook Connect much, what does this all mean? To the average user, Facebook Connect basically allows you to use your Facebook ID to login to non-Facebook sites that support Facebook Connect. This saves a whole lot of trouble trying to create separate accounts on each website and memorising passwords all over the place. An added bonus is that these non-Facebook sites have the option of publishing your activity on those sites to your Facebook profile. This just enhances the whole centralisation of “what you are up to” to Facebook, but of course you don’t have to publish it to your Facebook profile if you don’t want to. So how does the iPhone story fit in? 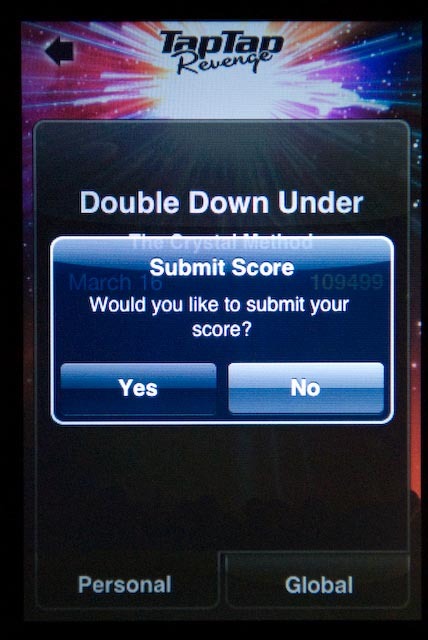 The iPhone has a huge array of applications and games. Some of these support network play, leaderboards, etc, but so far, you have to create yet another user account and keep track of that! And then once you do, how do you find your friends on there? 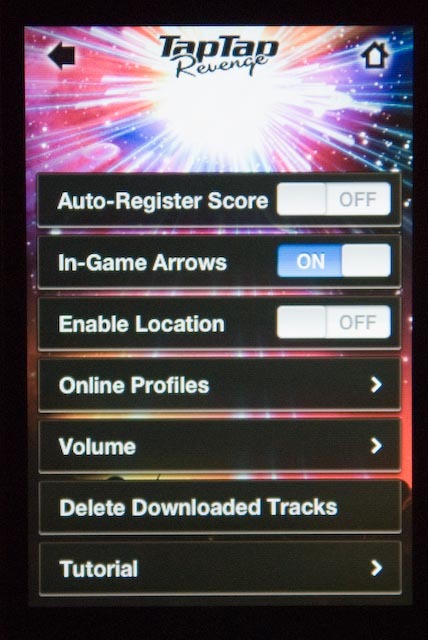 Now you have to look up the user accounts of your friends on these other iPhone gaming systems. With Facebook Connect support on iPhone applications, you can now login using your Facebook ID to supported iPhone games and applications. 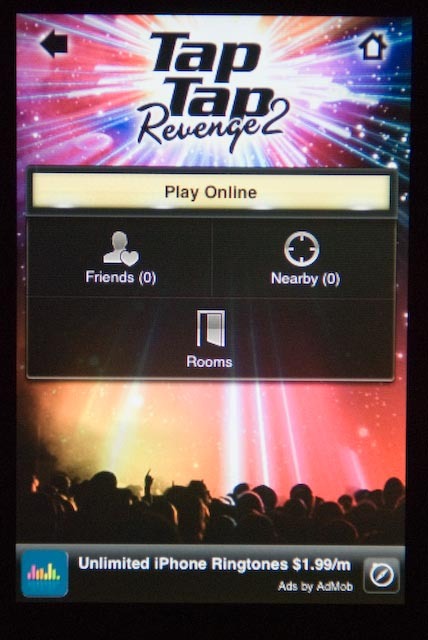 It’s sort of like playing those Facebook games like Poker, Scramble, etc, but on your mobile device. Sure there’s other systems like Microsoft Live, but Facebook have really taken it to the next step by pushing this into the mobile world. 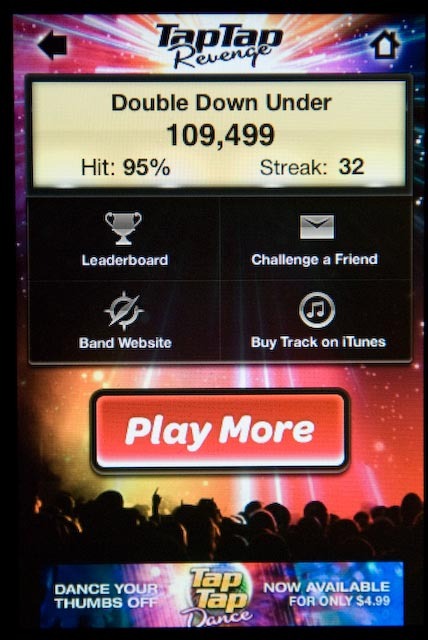 Tap Tap Revenge is a music rhythm DDR/Guitar Hero type game on the iPhone. 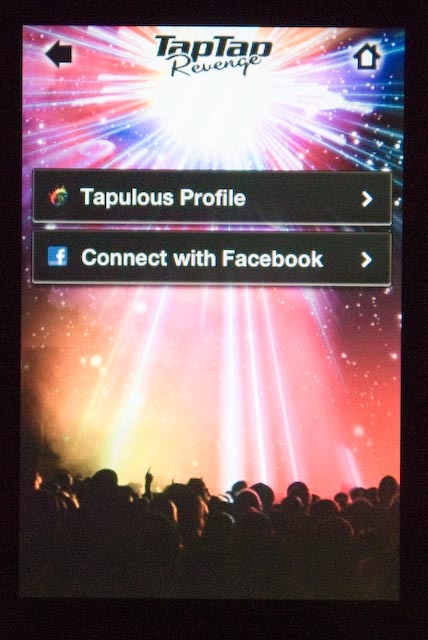 Last night I updated Tap Tap Revenge 2 to the latest version, which now supports Facebook Connect. 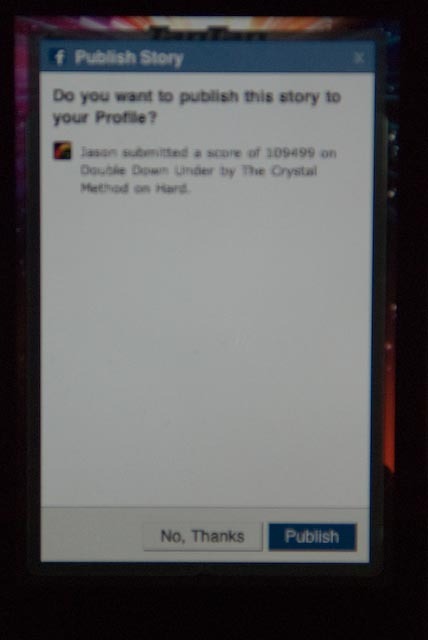 I can play an Online Game, I can play against Facebook friends (who are online, have an iPhone and Tap Tap Revenge 2 – which is none at the moment 😦 😦 ), and Tap Tap Revenge 2 can publish my latest scores to my Facebook profile. I like it. I know there will be people who don’t like all this control by Facebook, and the centralisation of their user data, but it’s optional. If you don’t like it, don’t use it. Connect my PlayStation Network identity to Facebook somehow. That would be neat. Play games on my mobile with people playing on Facebook on a computer. Imagine being able to play the next move on Scrabble or Chess or Scramble on either your mobile device natively (not through your mobile phone’s web browser) or on a PC. Show me which of my friends are nearby. Maybe the iPhone 3.0 firmware will help go some of this way. Hmm…. Oh, and continue porting Nintendo DS type platform and other games to the iPhone platform. You wouldn’t need any other device!! Our home calendar – to store our family related events, kids activities, school activities, etc. This year, I’ve decided to try to electronicize some of this – it’s just getting too hard to keep so many diaries and calendars up to date with each other. So as a first step, instead of using my A5 personal diary, I’m using Google Calendars. I tried to convince my wifey that we should use Google Calendar instead of our home calendar and her A5 diary, but she says that she likes to take her calendar with her and doesn’t want to go to a computer each time she has to see what’s coming up. Oh well. For me, to solve the problem of looking at the calendar on the go, I have looked at using the calendar on my iPhone 3G. So after a bit of investigation, and setting up, I now have a system where my work Outlook calendar, my Google calendar and my Facebook events and birthdays are all sync’d to my iPhone!! I can also access all my calendars on my laptop at home through Google Calendars. Unfortunately, for now, my Outlook calendar at work only shows my work calendar and nothing else, but that’s OK – I’m not sure if I want to clutter it anymore. And plus, I can always access my personal calendars at work through Google Calendars or on my iPhone anyway. I’m using NuevaSync to sync all the Google Calendars with my iPhone 3G. It supports up to 8 multiple Google calendars, which is great, because I currently have 7 Google Calendars (including some generic ones like “Australian Holidays”). Google has just released a beta version of Google Sync which is their solution which does the same thing, but apparently it’s limited to 5 calendars only (http://peterleshaw.blogspot.com/2009/02/google-sync-beta-vs-nuevasync.html). 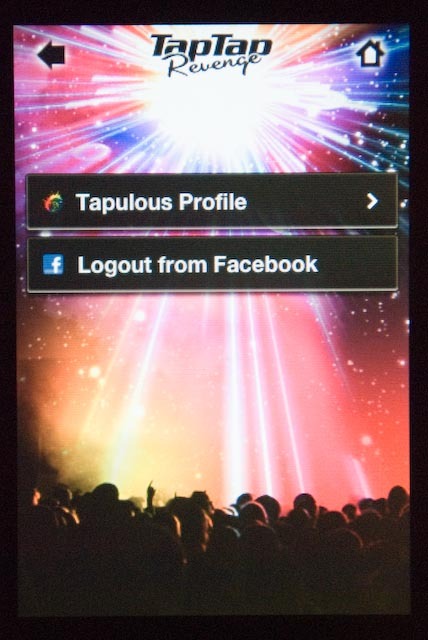 FbCal allows you to sync Facebook Birthdays and Events from Facebook to Google Calendars. Seamless! There’s several ways of sync’ing Google Calendars to Outlook. I’ve seen posts on other solutions like Remote Calendar and Plaxo, but I haven’t tried these yet (Plaxo seems to be yet another calendar server – do I need yet another one?). There’s also ways of just pointing Outlook at the Google Calendar for a read only version of it. I’m currently using Google Calendar Sync. Unfortunately, it only syncs a single Outlook calendar with your main Google Calendar, but I don’t mind my work Outlook calendar being just for work only. Since it only syncs with the main Google calendar, I’ve made my main one my work one, and placed my personal Google calendars as separate ones. So, going back to our family’s calendar mess – it’s still slightly there – for my wifey 🙂 But for me, it’s all electronic in 2009! I’ve been running into many problems when trying to upload photos to Facebook. I usually select a large number to upload at once and then the browser starts to do its thing. Unfortunately, lately it always fails. I did a Google and found quite a few other people with the same problem but there didn’t seem to be any silver bullet to solving the problem. I found I had an hour or two on the weekend to investigate it further and eventually was able to upload the latest photos from our Italy trip. WARNING: Going to buffer response body of large or unknown size. Using getResponseAsStream instead is recommended. I Googled these errors and didn’t find much but did find a Facebook discussion where others had the same problem. It seemed that the uploader would try to upload the photos, then get near the end, wait for a response from the Facebook server, and then decide to try uploading all the photos again. I then made sure I had the latest Java toolkit and Java console. It still made no difference. In Internet Explorer, I checked the ActiveX controls I’ve downloaded and found that my PC actually had 3 different Facebook uploaders but was only using one. Just to be sure, I deleted all of them and went back to the Facebook site again to reinstall it. It still made no difference. I managed to get up to 18 photos to upload at once with no problems. Momentarily I was joyous! I could upload my holiday photos in batches of 18, although I still have problems trying to make out the photos in the thumbnail view. This went all right, until it failed again. And this time on only 11 photos. I reduced the number down to 6, then down to 1 – and it still failed. Check internet connection – OK. It turns out that the Facebook photo uploader was having problems with one particular photo of mine. Don’t know why – it was the same dimensions and roughly the same size as the others. But I didn’t upload that one and it was fine from then onwards. I’m pretty sure I’ve uploaded near the maximum of 60 before in one shot before – but this was at my previous place with ADSL2. I’m unfortunately only on ADSL1 at the moment with an upload speed of 128k. My gut feel is that it’s something to do with the time taken to upload or response time, which is related to my connection speed and the number of photos I’m uploading. For now, I’m happy to find my magic breaking point of ~18 photos. Something for others to think about if they’re having problems! I’ve noticed that this blog post still gets a lot of hits! I’m not sure whether these techniques work for anyone or not. Lately, I’ve been having much more success uploading to Facebook if I resize my photos first to a maximum width of 1024 pixels and upload smaller groups at a time. It even works with the Java based uploader! I think my mistake above, nearly a year ago, was to upload the photos taken directly by my digital camera. With digital cameras commonly having 8-12 megapixels nowadays, the images produced are really too large for viewing on computer screens. The solution is to resize your photo BEFORE uploading. This makes the size of the photo drop dramatically too, and reduces the work that the Facebook uploader would do in resizing the photo. Hope this helps someone out there! I tried again on the weekend to upload some photos to Facebook and it still didn’t work reliably. But then I tried using the Facebook publishing tool in iPhoto, and it worked successfully the very first time! 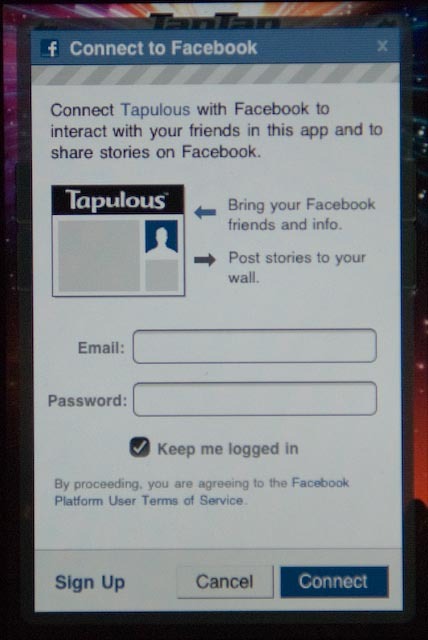 This really leads me to believe it’s the java code in Facebook’s uploading page that is not very robust. So, if you have a Mac, use iPhoto. Excellent news for all Scrabble fans on facebook! Scrabulous has returned but under a different name and form. Time to resurrect some long lost rivalries!